Prep officials welcomed to Taizhou, China. 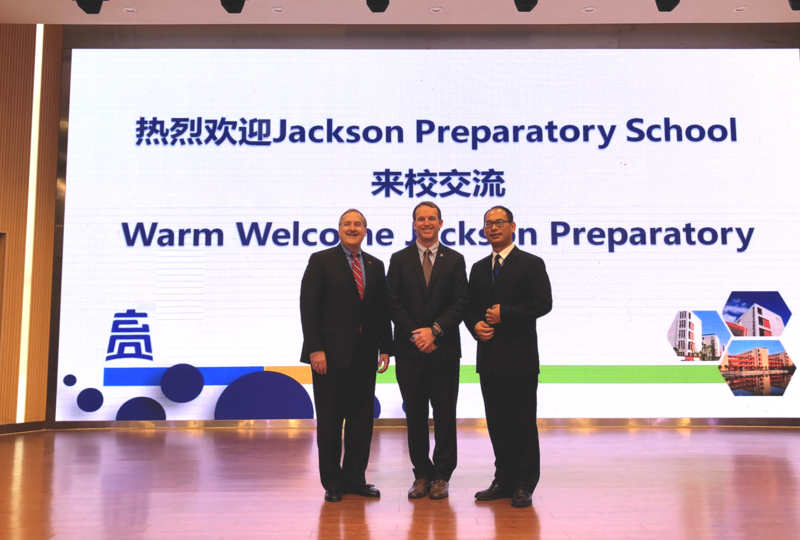 On the week of October 21-27, Jackson Prep Head of School Mr. Lawrence Coco, along with Chief Operating Officer Mr. Denny Britt and International Program director Ms. Jane Zhu, embarked on a trip to China. The trip consisted of a hectic schedule that kept the trio busy during their time there. The purpose of this trip was to connect with leaders in education and students alike in order to gain insight about what Prep can do to further grow its International Program. The journey began with a flight from Jackson to Dallas on Sunday. From there, the three traveled from Dallas to Shanghai, in China. The flight lasted a total of 14 hours, and from Shanghai they had to travel by train for 4 hours to Taizhou, a city on the eastern coast of China. By this time, it was Monday evening, and the three had a busy day ahead of them on Tuesday. 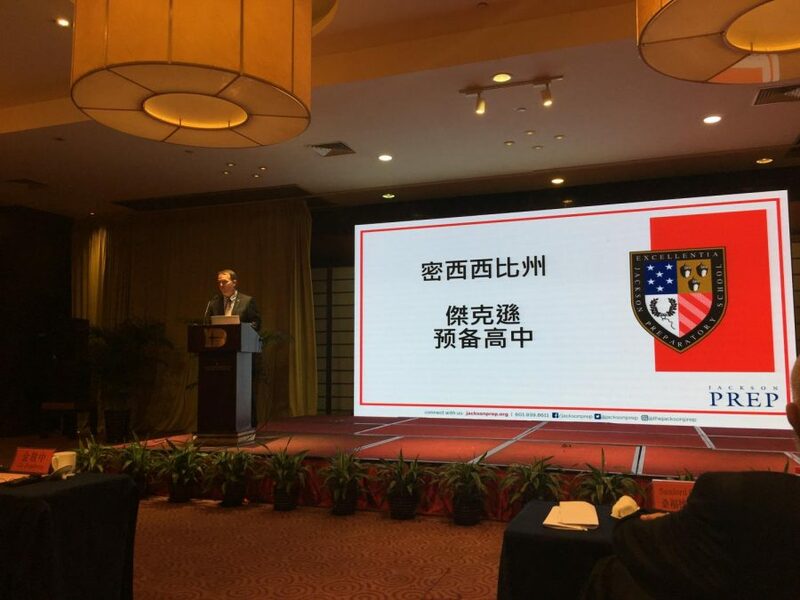 After a night of relatively little sleep, Mr. Coco, Mr. Britt, and Ms. Zhu presented at a conference on STEAM (Science, Technology, Engineering, Arts, and Mathematics), in Taizhou. Leaders from schools in the United States, as well as England and China were all present. All three faculty members presented on Jackson Prep at the conference as well, discussing ways in which they incorporate immersive and experiential learning techniques provided by former Jackson Prep faculty at the school. On Tuesday evening, the three visited a public boarding school in Taizhou. Here, they presented to a group of over 400 10th graders about Jackson Prep and the International Program there. They also showed them the Prep Preview open house video, and had a Q&A session at the end about Prep and how school is handled in the United States. At the school, the students attend class from 7:00 A.M. to 5:00 P.M., Monday-Friday. The students stay overnight on weeknights, and then go home to their families on the weekends. The morning after, they took a tour of the school itself. Following the school visit, the trio traveled from Taizhou to Kunming on Wednesday afternoon. They connected with Prep sophomore Brittany Jiang’s parents here and had dinner with them. On Thursday, they visited Brittany’s elementary school and visited the market in Kunming, where they met with prospective parents interested in the International Program at Prep. The following morning, they took a brief break and toured a park in Kunming and had lunch with both juniors Roaman Zhou and Felix Lyu’s parents, and also with Brittany’s parents. Finally, after several days of gaining much insight, the three flew back to Shanghai on Friday night, where they spent the night. On Saturday, they flew back to Dallas and from there home to Jackson, arriving around 10:30 P.M. after 25 hours total of travel. When asked about what a big takeaway was from the trip, Mr. Coco said, “It was fascinating to see the difference in the way they do school. The high school curriculum is focused almost entirely on math and sciences, but most importantly the University exam (known as the National Higher Education Entrance Examination), and there is a tremendous amount of pressure on students, teachers, and administrators. The higher you score on the exam, the better the university you get into.” He went on to say, “The school is graded on how many students they place into top universities. The classrooms aren’t that much bigger than Prep’s and consist of about 50 students, and the students don’t switch classes. The teachers switch classes.” Mr. Coco also said one of his favorite parts of the trip was meeting the parents. 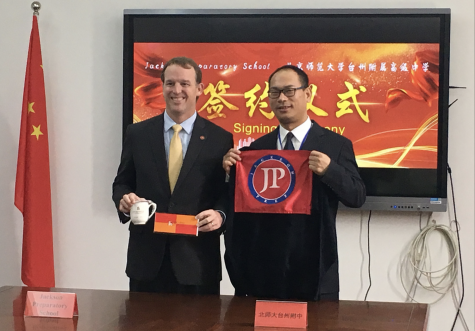 Mr. Coco trades school paraphernalia with a Chinese official. Along with Mr. Coco, Mr. Britt and Ms. Zhu also came away with greater insights, and are looking forward to a visit by some of the students they visited in China. On February 9-14, 2019, a contingent of 20 students will visit Prep, and will be at the school for 4 full days. Ms. Zhu said, “We are planning for them to do many activities, such as experiences in robotics, the new drone club, Fusion and Reveillon, a basketball scrimmage, and possibly a math competition.” She also said there is a need for host families to accommodate the students while they are here, and also student ambassadors to accompany the students while they are at Prep during the school day.Another endeavor that is in the works is a reciprocal trip to China led by Ms. Zhu and Mr. Adam Mangana. The trip is slated to take place over spring break, March 7-16, 2019. 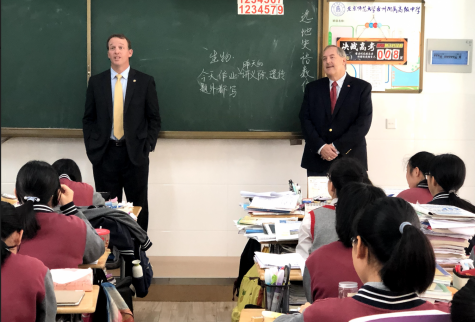 Students attending will visit the boarding school in Taizhou that the Prep faculty members visited on the trip, and will also experience the cities of Beijing and Shanghai. For more information about the program, contact Ms. Zhu at [email protected].